Here you can see how your ads would look like on Desktop and Mobile. 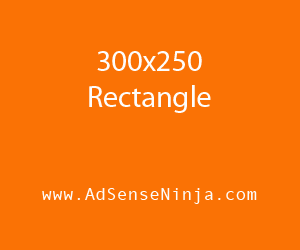 On Desktop devices, the ad unit under title (Top Ad) rotates between a Responsive centered, 336×280 Rectangle ad unit (AdSense AB Testing in action). Reload the page several times to see different ad variants. There are two ad variants for Desktop and two for ad variants Mobile – four ad units in total. Now, which Ad Size is more likely to earn more income? Most people reserve to using a Responsive ad unit, to “cover their bases” or serve both desktop and mobile platforms. This leads to as much as 80% lost revenue. However with AdSense Ninja WP plugin, you can display best paying ad size on each platform. If you are not sure which ad size pays more, ran an AB test (minimum of 10,000 ad impressions recommended to get meaningful results). Once you definitively know which ad size pays more, turn off AB testing, and use the winning variant, and earn more income from your site! This is a real split-test (A/B/C) for top ad placement. 3 versions are shown equally, and after “enough” page page views or time of running the test, you can figure out which ad works best in this place (top). You can AB test any placement on the website! Reload the page several times to see different positions. Here is a test of in-content ad being centered or float left, or wrap content on the left. Again – reload the page to see different versions of split-test. We recommend running only 1 split test at a time, unless you have 1000 daily pageviews, to see real results. In any case, you should run the test for at least 2 weeks. Testing Mobile Version of your theme in Desktop browser. The best browser to test this on is Chrome, because it includes Mobile User Agent simulator out of the box – no need to install add-ons, plugins, etc. If you use another browser, find on google how to simulate iPhone or Android phone User Agent. Note that FireFox does not simulate User Agent – only responsive layout. However, to automatically show mobile ad for smartphone visitor, your site needs to know that it’s a mobile device, based on User Agent. Toggle Developer Toolbar (Mobile Simulator) by pressing Ctrl+Shift+M on Windows, Linux or Cmd+Shift+M on Mac. Choose 100% view to see better. We recommend toggling developer tools to the right, when simulating Mobile Device.